Roasted chicken is a simple and versatile protein. Use it in soups, throw it on pasta or pair it with a simple salad. Roasted chicken is a simple and versatile protein. Use it in soups, throw it on pasta or pair it with a simple salad. * For Passover, use olive oil in place of butter. 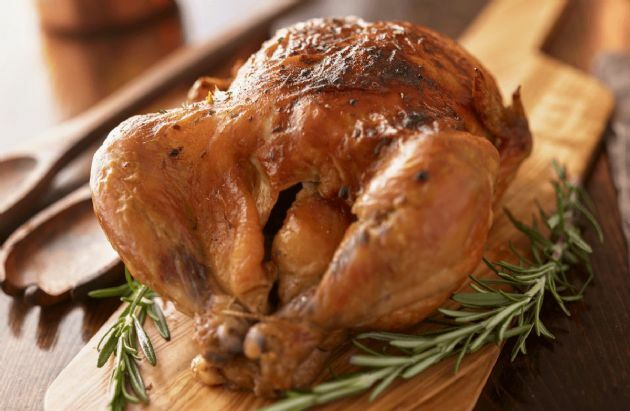 Save time and energy by roasting two chickens at once and freezing one (carve it first). Please note that serving sizes will vary. The nutrition is calculated for 1/4 of the chicken. Add the appropriate number of ounces of dark meat or light meat to your Nutrition Tracker. Mix the butter, oil, and rosemary together in a small bowl. Gently lift up chicken skin from the breast and rub oil and butter mixture between the flesh and skin. Season chicken inside and out with salt and pepper. Place chicken in roasting pan on a roasting rack or bed of vegetables. Place lemon inside the cavity of the chicken. Tie legs together with cotton string. Reduce oven temperature to 375 degrees Fahrenheit. Roast chicken until meat thermometer inserted into thickest part of inner thigh registers 180 -185 degrees Fahrenheit, about 1 hour 15 minutes. Lift chicken and tilt slightly, emptying juices from cavity into pan. Juices should be clear. Transfer chicken to cutting board. Cover chicken with aluminum foil to keep warm and wait 10 minutes before carving. NOTE: Save about 125 calories and 11 g fat per serving by removing the skin. I made this the other night for dinner and it was great. The lemon added a great flavor to the meat. I did make 2 chickens and I am planning on making chicken stock next weekend.